Where does our fish originate? 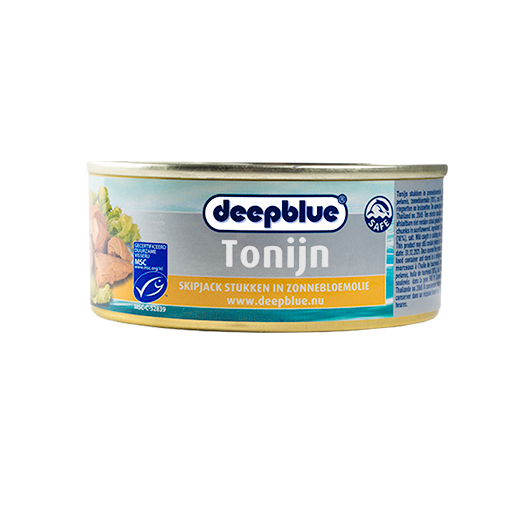 Ingredients: Anchovies (FISH) Engraulis ringens, olive oil, salt. Typical values per 100 g: Energy 815 kJ/195 kcal, Fat 9.4 g (of which saturates 1.4 g), Carbohydrates 0.0 g (of which sugars 0.0 g), Protein 28 g, Salt 15,00 g.
This is an indication, look at the label for the actual nutritional values. 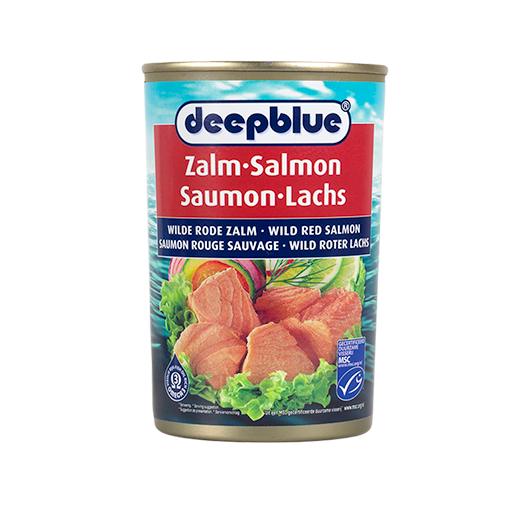 Ingredients: Cod liver (FISH) Gadus morhue, salt. 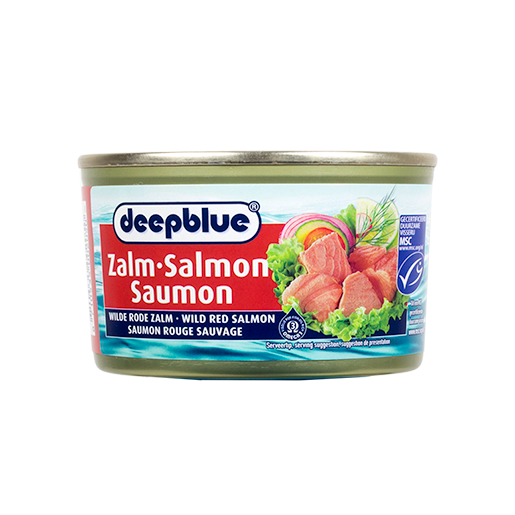 Ingredients: Crab (65 – 70% meat, 30 – 35% legs) (CRUSTACEAN) Portunus pelagicus, water, salt, acid: E330, preservative: E223 (SULPHITE). 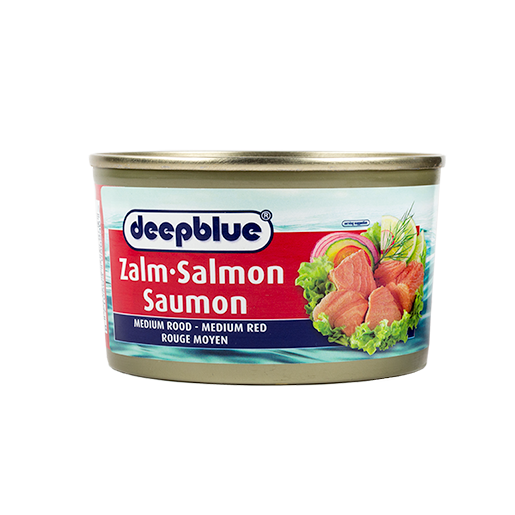 Typical values per 100 g: Energy 204 kJ/48 kcal, Fat 0.0 g (of which saturates 0.0 g), Carbohydrates 1.0 g (of which sugars 0.0 g), Protein 11 g, Salt 0.85 g.
Ingredients: Herring (FISH) Clupea harengus (60%), MUSTARD sauce (water, MUSTARD (11%) (water, MUSTARD seed, vinegar, salt, spices), vegetable oil (rapeseed), sugar, vinegar, salt, tomato paste, rice starch, thickener: guar gum, natural flavouring). 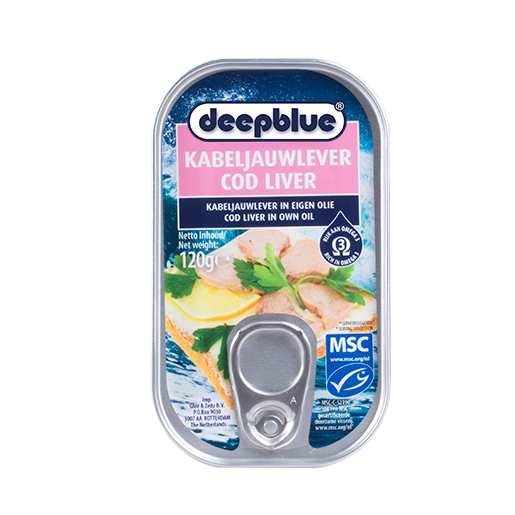 Typical values per 100 g: Energy 920 kJ/220 kcal, Fat 17 g (of which saturates: 2.6 g), Carbohydrates 3.7 g (of which sugars 3.2 g ), Protein 13 g, Salt 1.10 g.
Ingredients: Herring(FISH) clupea harengus (60%), pepper sauce (water, tomato paste, vegetable oil(rapeseed), sugar, vinegar, salt, pepper (0.8%), rice starch, thickener: guar gum, spices). 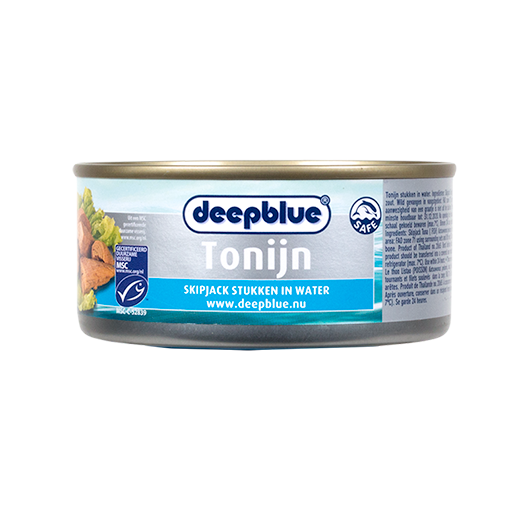 Typical values per 100 g: Energy 920 kJ/220 kcal, Fat 16 g (of which saturates 2.8 g), Carbohydrates 6.0 g (of which sugars 5.6 g), Protein 13 g, Salt 1.50 g.
Ingredients: Herring(FISH) Clupea harengus (60%), tomato sauce (water, tomato paste (9%), vegetable oil (rapeseed), sugar, modified maize starch, vinegar, thickener: guar gum, salt, maltodextrin, dextrose,spices, spice extract, flavor). 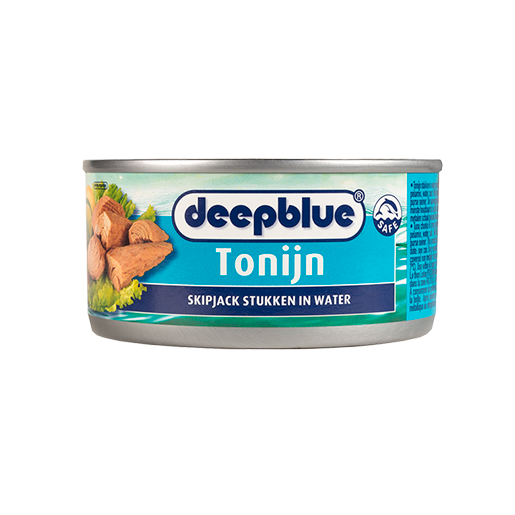 Typical values per 100 g: Energy 940 kJ/226 kcal, Fat 17 g (of which saturates 2.8 g), Carbohydrates 5.5 g (of which sugars 4.9 g), Protein 13g, Salt 1.20 g.
Ingredients: Mackerel (FISH) Scomber japonicus, vegetable oil (sunflower), salt. 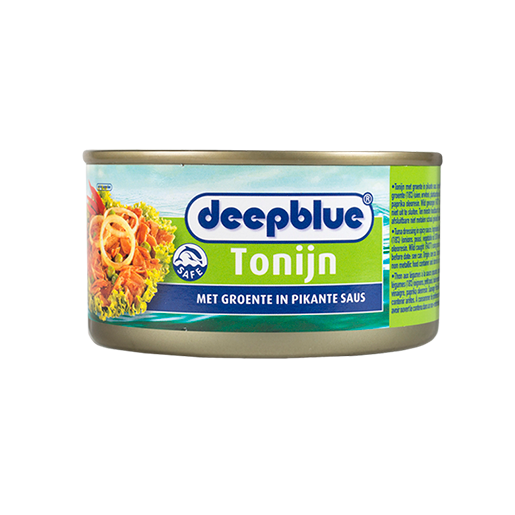 Typical values per 100 g drained weight: Energy 605 kJ/144 kcal, Fat 3.9 g (of which saturates 0.8 g), Carbohydrates 0.1 g (of which sugars 0.1 g), Protein 27 g, Salt 0.64 g.
Ingredients: Mussels (MOLLUSCS) Mytilus galloprovincialis (62%), sauce (38%) (sunflower oil, vinegar, salt, spices). 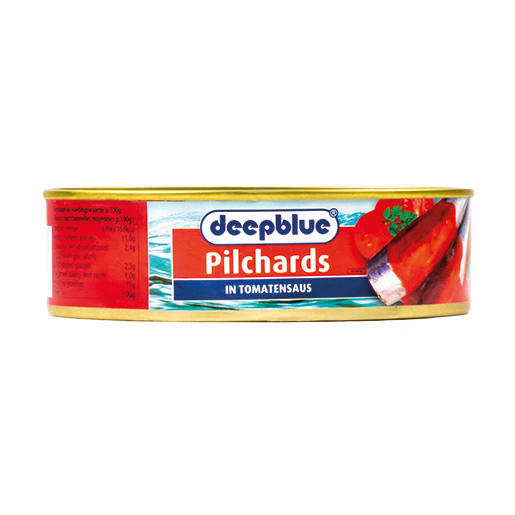 Typical values per 100 g: Energy 615 kJ/147 kcal, Fat 6.2 g (of which saturates 1.6 g), Carbohydrates 1.9 g (of which sugars 0.2 g), Protein 21 g, Salt 1.50 g.
Ingredients: pilchards (FISH) Sardina pilchardus (60%), tomato sauce (water, tomato paste (9%), modified starch (tapioca), thickener: E412, sugar, salt, vegetable oil (SOY), colour: E160c). 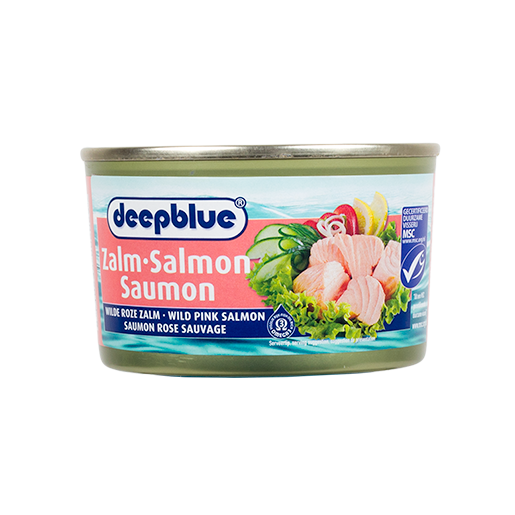 Typical values per 100 g: Energy 550kJ/131 kcal, Fat 4.6 g (of which saturates 1.3 g), Carbohydrates 8.5 g (of which sugars 0.7 g), Protein 13.2 g, Salt 0.83 g.
Ingredients: Sockeye salmon (FISH) Oncorhynchus nerka (99%), salt. 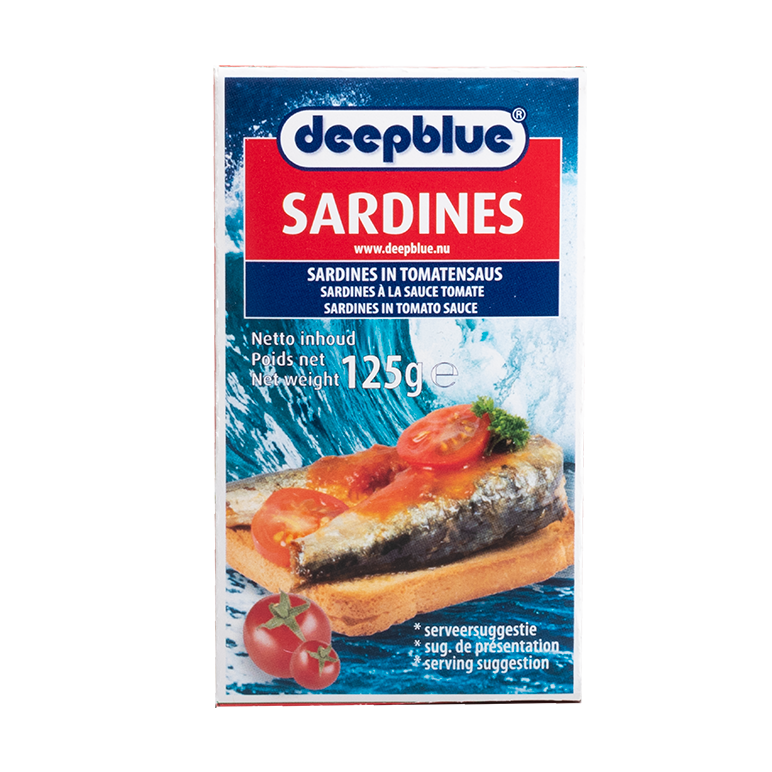 Typical values per 100 g: Energy 619 kJ/148 kcal, Fat 7.3 g (of which saturates 1.6 g), Carbohydrates 0.0 g (of which sugars 0.0 g), Protein 21 g, Salt 1.35 g.
Ingredients: Sardines (FISH) Sardinus pilchardus, vegetable oil (sunflower), salt. 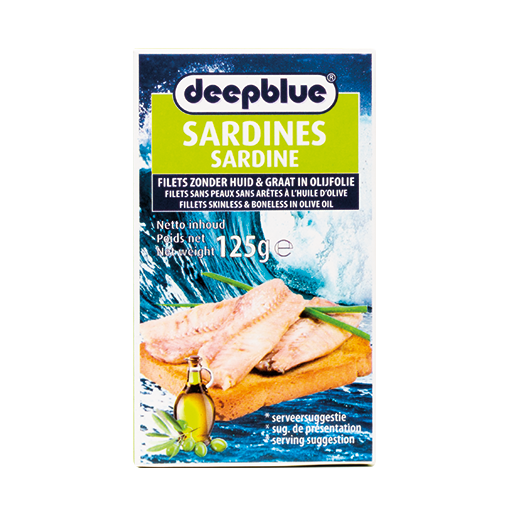 Typical values per 100 g: Energy 899 kJ/216 kcal, Fat 14 g (of which saturates 2.0 g), Carbohydrates 0.4 g (of which sugars 0.0 g), Protein 22 g, Salt 1.10 g.
Ingredients: Sardines (FISH) Sardinus pilchardus, tomato sauce, salt. 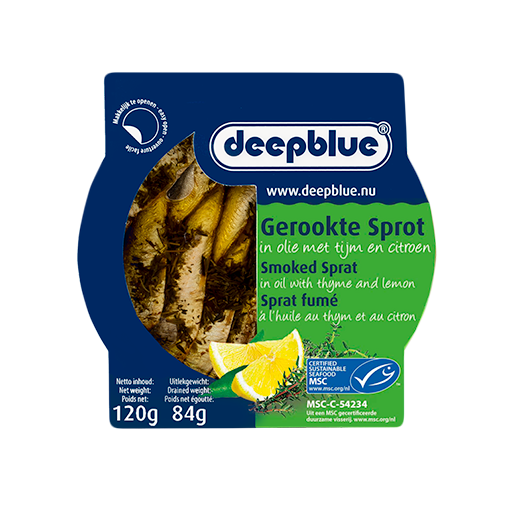 Typical values per 100 g: Energy 741 kJ/177 kcal, Fat 10,5 g (of which saturates 2.7 g), Carbohydrates 0.0 g (of which sugars 0.0 g), Protein 21 g, Salt 1.50 g.
Ingredients: Smoked sprat(FISH) Sprattus sprattus(75%), rapeseed oil, salt, thyme (0,5%), lemon oil(0,1%). 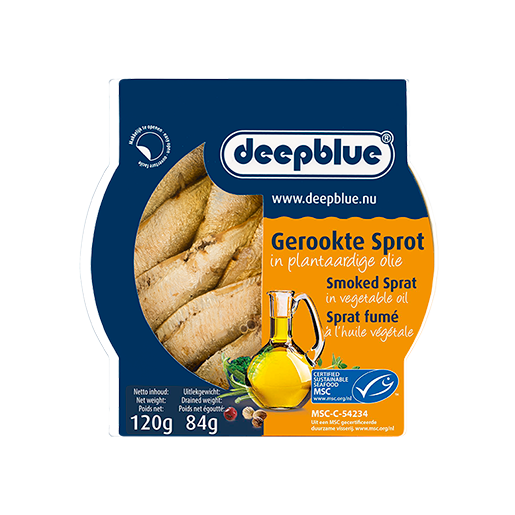 Typical values per 100 g: Energy 740 kJ/177 kcal, Fat 10,2 g (of which saturates 2,0 g), Carbohydrates 0,1 g (of which sugars 0,1 g), Protein 21 g, Salt 1,20 g.
Ingredients: Smoked sprat(FISH) Sprattus sprattus(75%), rapeseed oil, salt. 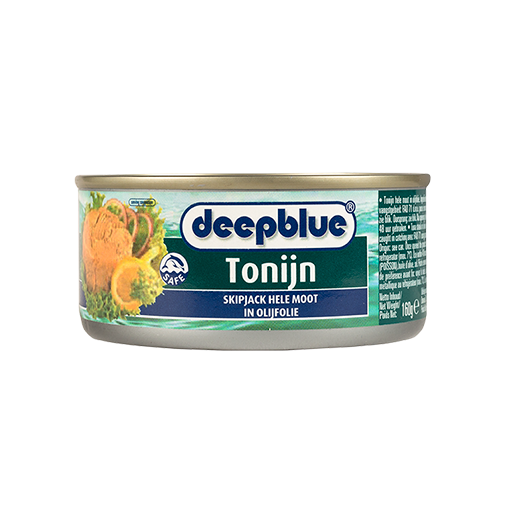 Ingredients: Squid (MOLLUSCS) Dosidicus gigas, Illex spp, Todarodes saggittas, sunflower oil, salt. Typical values per 100 g: Energy 587 KJ/140 kcal, Fat 4,7 g (of which saturates 0,7 g), Carbohydrates 2,2 g (of which sugars 0,0 g), Protein 24 g, Salt 1.50 g.
Ingredients : Squid (65 %) ( MOLLUSCS ) Dosidicus gigas , sunflower oil, garlic (1.7%) , salt. 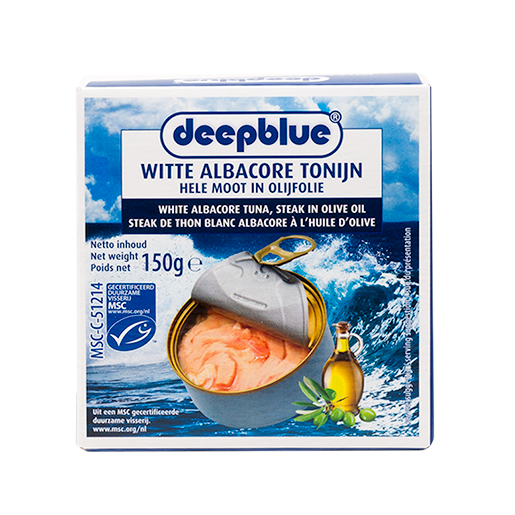 Typical values per 100 g : Energy 366kJ / 87kcal , Fat 2,0 g ( of which saturates 0,4 g) , Carbohydrates 2,2 g (of which sugars 0,0 g) , Protein 15 g, Salt 1,20 g.
Ingredients: White Albacore tuna (FISH) Thunnus alalunga, olive oil, salt. Typical values per 100 g: Energy 653kJ/156 kcal, Fat 6.9 g (of which saturates 0.9 g), Carbohydrates 0.0 g (of which sugars 0.0 g), Protein 23 g, Salt 1.20 g.
Ingredients: Skipjack tuna (FISH) Katsuwonus pelamis, water, salt. Typical values per 100 g: Energy 430 kJ/101 kcal, Fat 0.6 g (of which saturates 0.2 g), Carbohydrates 0.0 g (of which sugars 0.0 g), Protein 24 g, Salt 0.65 g.
Typical values per 100 g: Energy 483 kJ/114 kcal, Fat 1.1 g (of which saturates 0.4 g), Carbohydrates 0.0 g (of which sugars 0.0 g), Protein 26 g, Salt 1.20 g.
Typical values per 100 g: Energy 358 kJ/85 kcal, Fat 0,5 g (of which saturates 0.2 g), Carbohydrates 0.0 g (of which sugars 0.0 g), Protein 20 g, Salt 0.75 g.
Ingredients: Skipjack tuna (FISH) Katsuwonus pelamis, vegetable oil (sunflower), salt. Typical values per 100 g: Energy 609 kJ/145 kcal, Fat 4.5 g (of which saturates 1.4 g), Carbohydrates 0.0 g (of which sugars 0.0 g), Protein 26 g, Salt 0.50 g.
Typical values per 100 g: Energy 775 kJ/185 kcal, Fat 9.0 g (of which saturates 1.4 g), Carbohydrates 0.0 g (of which sugars 0.0 g), Protein 26 g, Salt 1.20 g.
Ingredients: Skipjack tuna (FISH) Katsuwonus pelamis, sunfloweroil, salt. 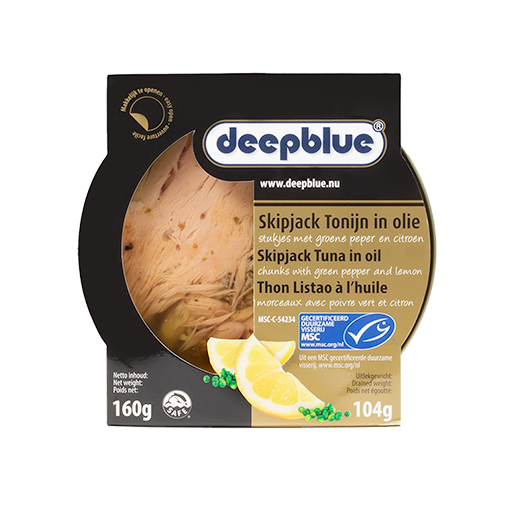 Typical values per 100 g: Energy 418kJ/100 kcal, Fat 2.0 g (of which saturates 0.3 g), Carbohydrates 0.0 g (of which sugars 0.0 g), Protein 21 g, Salt 0.75 g.
Ingredients: Skipjack tuna (FISH) Katsuwonus pelamis, olive oil, salt. 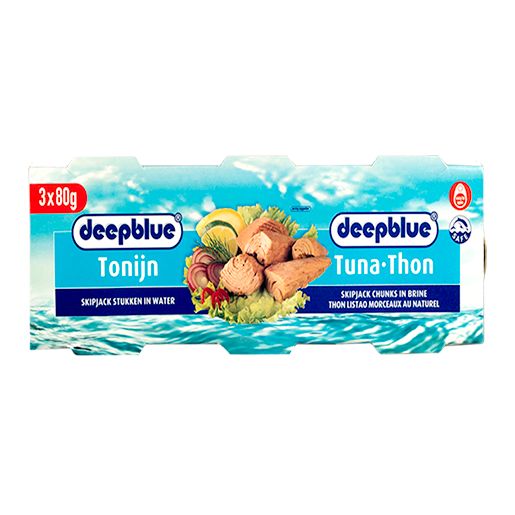 Typical values per 100 g: Energy 812 kJ/194 kcal, Fat 10.0 g (of which saturates 1.5 g), Carbohydrates 0.0 g (of which sugars 0.0 g), Protein 26 g, Salt 1.20 g.
Ingredients: Skipjack tuna (FISH) Katsuwonus pelamis, springwater, salt. Typical values per 100 g: Energy 459 kJ/108 kcal, Fat 1,2 g (of which saturates 0.4 g), Carbohydrates 0.0 g (of which sugars 0.0 g), Protein 24 g, Salt 1.24 g.
Ingredients: Skipjack tuna (FISH) Katsuwonus pelamis (48%), vegetables (onion, pea) (17%), water, sugar, salt, thickener: E412, vegetable oil (SOYA), tomato paste, vinegar, paprika extract. 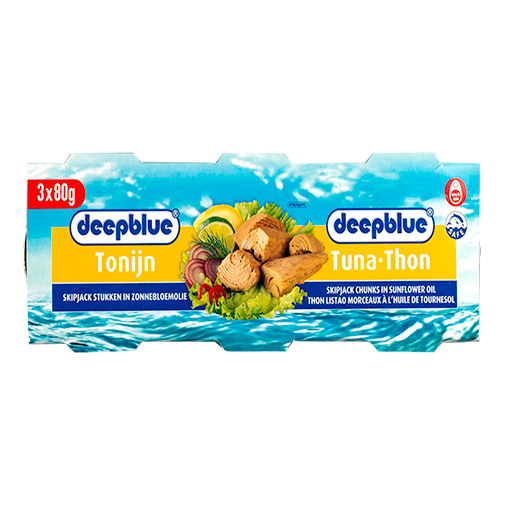 Typical values per 100 g: Energy 333 kJ/79 kcal, Fat 1.1 g (of which saturates 0.2 g), Carbohydrates 5.6 g (of which sugars 4.5 g), Protein 11.6 g, Salt 1.33 g.
Ingredients: Skipjack tuna (FISH) Katsuwonus pelamis, rapeseed oil, green pepper (0,8%), salt, lemon oil (0,1%). 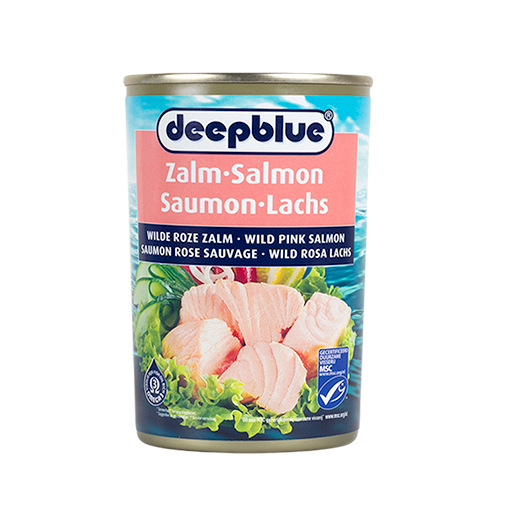 Typical values per 100 g: Energy 996kJ/ 239 kcal, Fat 15 g (of which saturates 0.9 g), Carbohydrates 0,0 g (of which sugars 0,0g), Protein 25 g, Salt 0,70 g.
Ingredients: pink salmon (FISH) Oncorhynchus gorbuscha (99%), salt. Typical values per 100 g: Energy 566 kJ / 135 kcal, Fat 6.1 g (of which saturates 1.5 g), Carbohydrates 0.0 g (of which sugars 0.0 g), Protein 20 g, Salt 1.39 g.
Typical values per 100 g: Energy 619kJ/148 kcal, Fat 7.3 g (of which saturates 1.6 g), Carbohydrates 0.0 g (of which sugars 0.0 g), Protein 21 g, Salt 1.35 g.
For decades, Deepblue has been one of the Netherlands’ best known brands for canned fish – with good reason!